Sorry I didn’t reply earlier. I just had a senior moment and passed you by. In answer to your question. Have him go to our DEEPER section of THEI and he will find lots of my personal research into the Hollow Earth and links to the research book. Thanks for you kind words. We’ll keep trying. of your story. I can’t believe you are not more popular given that you certainly possess the gift. I am very intrigued by the Hollow Earth Theory and reading about Admiral Byrd has increased my interest. I have been unable to find a registration link to receive your newsletter. Even when a try to log in failed there was no link to registration. We don’t exactly publish a newsletter anymore. 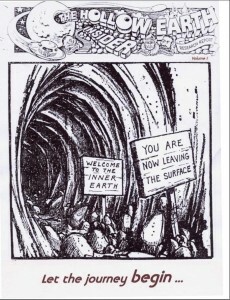 Dennis started The Hollow Earth Insider as a newsletter, yes, but it is now uniquely a web news site (with the world’s best newsletter archive about Hollow Earth under the heading “DEEPER”). There is a collection in there exceeding 550 pages of the old THEI newsletters. If we ever manage to resurrect the old forum as well, it will exceed 4500 pages. We do offer a notification service for when something changes on the new site (normally, that’s around a half dozen to 2 dozen times per day). Directly below the “donate” button in the right column, you can sign up for change notices delivered in your email. It’s private and secure and will let you know when new stories or comments are added. I hope you continue to enjoy both the content and the intent of The Hollow Earth Insider. John Lear has appeared on https://www.coasttocoastam.com/shows/archive several times. On the June 28, 2015 episode (see link at top), he talked with host George Knapp. Lear said that some of the underground military bases ( http://www.sauderzone.com.ipaddress.com/ & http://www.angelfire.com/ut/branton/redbook1.html ) go down – with elevator acess – 15-20 levels, and in some cases even more. Lear also said that the the U.S. Navy ( https://www.amazon.com/Secret-Program-Extraterrestrial-Alliance-Programs-ebook/dp/B01NAS4M58 & https://noriohayakawa.wordpress.com/2016/02/16/the-secret-group-com-12-in-1992-fact-fiction-or-disinformation/ ) has been able to navigate – using nuclear submarines – A HUGE UNDERGROUND NETWORK OR LABYRINTH of MASSIVE aquatic (WATER-FILLED) caverns and tunnels, which reach beneath AT LEAST 15 WESTERN U.S. STATES ( http://www.theeventchronicle.com/study/john-lear-navy-submarine-base-nevada-desert/ & https://www.bibliotecapleyades.net/sociopolitica/sociopol_lear03c.htm ). Are there also similar caverns ( http://www.angelfire.com/ut/branton/CaliFloats.html ) in the outer/lower slopes of the continental shelves of the EASTERN USA? Will the definition of the Navt S.E.A.L. (S) possibly one day in the future be changed to: S-ea, E-arth, A-ir, & L-abyrinth? Also, do these oceanic caverns reach to the area beneath northwester New Mexico? (see: http://www.angelfire.com/ut/branton/DulceMatrix.html ). If so, the Navy Seal’s and other Special Forces may be able to finally purge one of the darkest areas beneath the surface of the USA.